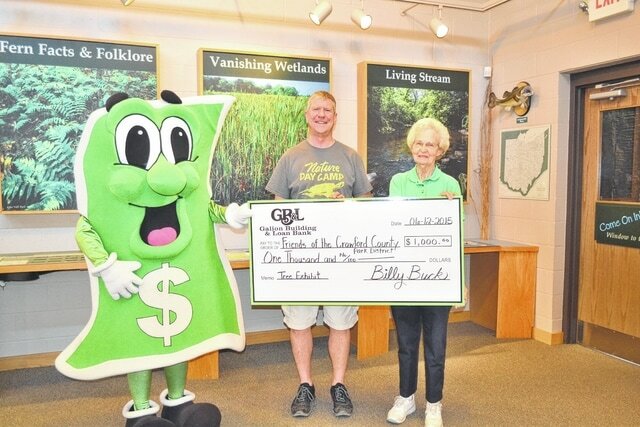 Billy Buck, Kids’ Club mascot at Galion Building & Loan Bank, presents a check for $1,000 to Crawford Parks Director, Bill Fisher and Lowe-Volk Nature Center volunteer, Martha Kozik. The check was a donation made to benefit the park’s Interactive Tree Project. The goals of the tree house project, to energize and engage children, are similar to those of GB&L’s Billy Buck Kids’ Club, along with promoting savings. Donations to the project can still be made at Lowe-Volk Park Nature Center, 2401 State Route 598, Crestline, OH 44827.